My big 2002 career move! Congrats to Paul from our cat! 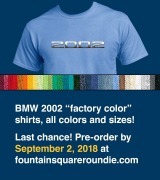 Last call for “factory color” shirts; this weekend is the end. Shirts will ship in September. We’re thrilled to have reached the needed minimum of 12 orders for both of the press runs (“2002” and “2002tii” design)—so we won’t be losing any money on this little venture! Here’s the color popularity breakdown: Multiple orders for Atlantik, Derby/Anthrazitgrau, Golf, Inka, Nevada, Riviera, Shwarz, and Verona. Single order for Agave, Arktisblau, Bristol, Caribe, Ceylon, Chamonix, Florida, Jadegrun/Amazonasgrun, Pastelblau, Polaris, Sahara, Malaga, Mintgrun, Taiga, and Turkis. No orders for Baikal, Colorado, Fjord, Granada, Granatrot, Sienabrun, Tundra, and Turf. Thanks all for your support! Halfway through the pre-order window, and here’s the color survey so far by order quantity: 4: Inka. 3: Verona. 2: Riviera, Schwarz. 1: Anthrazitgrau, Chamonix, Derby, Fjord, Golf, Malaga, Pastelblau, Polaris, Sahara, Turkis, Nevada. /// We hit the needed minimum of 12 “2002” shirts and are almost there with the “2002tii” ones. Looking at the above list tells me that the pre-shipping group photo will be cool. And, if scheduling allows, we may get video of the shirts on press at the printer in September. Thanks for the feedback; lighter-weight polyester shirts (“Active fit” not "Classic fit") have just been added to the Order page. There are fewer colors available (and you'll need to include a note with your order), but it is now an option. Malaga, Chaminox, Pastelblau and more! 2002 (or 2002tii) emblem on a “factory color” shirt. $25 each, pre-orders due by the end of August. Shirts printed and shipped in September. Order here. Shirts are Gildan Ultra Cotton, their heaviest weight. The emblem artwork will be printed with traditional silk screen with five colors--white, black and three greys. For the suspension, yes, we're looking at the Blunt refresh package. Everything on ours is shot. Since we have the old-style stock 13" wheels, we'll probably keep the brakes stock--rebuilding the calipers and replacing everything else. Would vented fronts fit? For the back, friends gave us some 320i drum upgrade parts. Great seeing you again, and thanks for signing one of our Celebrity Hubcaps! Scott, that "Nice German Woman" story is great.